FGE said in a note quoted by Bloomberg that Russia will start moving more Urals eastward right after the launch of the pipeline extension, at a rate of 160,000 bpd. The overall increase of Russian crude shipments to China, according to the consultancy, could be around 200,000 bpd. This means less oil for Europe, which is Russia’s number-one oil client. This only highlights the significance of Moscow’s Asian pivot amid lingering European sanctions following the 2014 annexation of Crimea and Russia’s involvement in separatist conflicts in the Ukraine. The Urals is currently trading at a discount of about $4 to Brent crude but WTI’s discount to the international benchmark is $6 a barrel. In other words, Russia’s diverting of crude oil from Europe to China could be an opportunity for U.S. exporters as long as they can keep their transport costs low enough. Europe will probably be grateful for the diversification. Over the long term, things are even more uncertain. Clearly, Russia has prioritized its relationship with China: In addition to the ESPO expansion, Gazprom is on track to complete the Power of Siberia gas pipeline by 2019. The 2,500-km mammoth of a pipeline will pump 1.3 trillion cu ft of gas to China annually. The country is already the third-largest consumer of natural gas in the world, behind the U.S. and Russia, and is expected to show the strongest demand growth over the coming decades—propelling it to second place by 2040 as the economy shifts away from coal. This soaring demand has already created shortages in parts of the country. A recent report by Eurasia Daily suggested the Power of Siberia will be essential in avoiding future gas shortages. Would that take gas away from Europe? It’s unlikely given Gazprom’s 30+-percent market share in Europe, and besides, there’s enough gas for everyone. 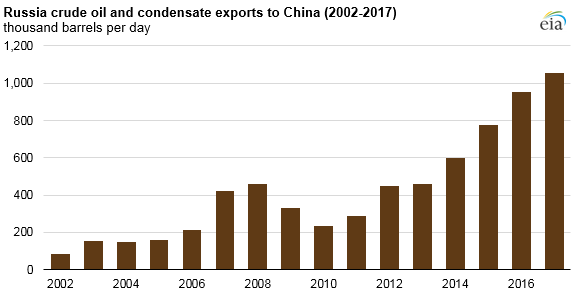 What might happen is China overtaking Europe as Russia’s biggest gas export market at some point in the future, especially if Russia–EU relations continue to be strained. With due respect, I don’t think that a reduction of Russian oil shipments to the European Union (EU) could add to the EU’s oil import bill. The EU could easily replace any reduction in Russian oil supplies with imports from the Middle without additional costs to them. With gas supplies, its is a different story. Russia’s China pivot aims to consolidate its position as the largest oil supplier to the world’s largest oil importer and also to diversify its oil export destinations rather than being dependent on the EU for the bulk of its oil exports. It also signals to the EU that they will be the eventual loser from a continuation of the sanctions against Russia. Putin’s strategic plan is to turn Russia into the world’s energy superpower. The reality of the 21st century—as Putin sees it—is that energy is a political instrument. Political alliances and the rise and fall of the international importance of particular countries will change in accordance with the energy supply routes.